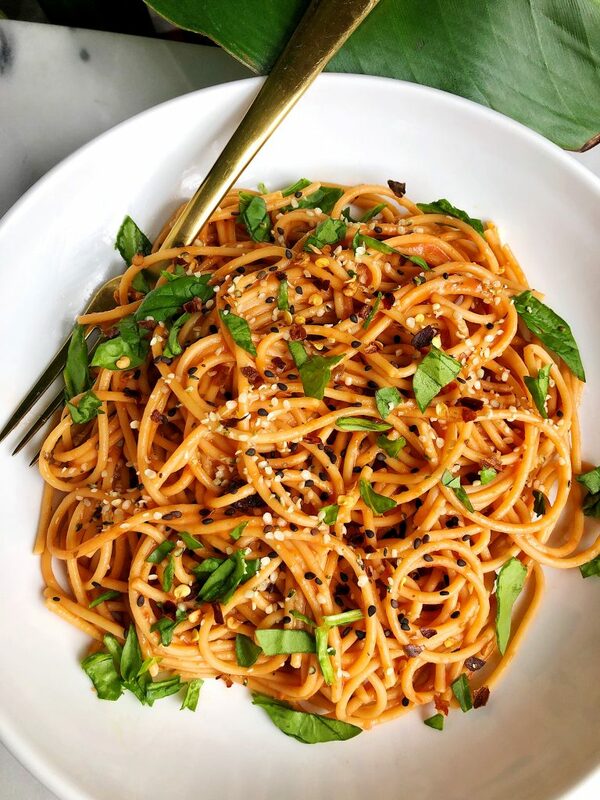 6-ingredient Creamy Tomato Basil Pasta made with all gluten-free, dairy-free ingredients for an easy and healthy pasta recipe! I’m not sure if it’s the fact that I’m 6.5 months pregnant, or the cold or what but lately pasta has been my jam! I have been craving all the cozy comforting foods and of course that means I’m over here trying to think of healthier ways to whip them up for us. 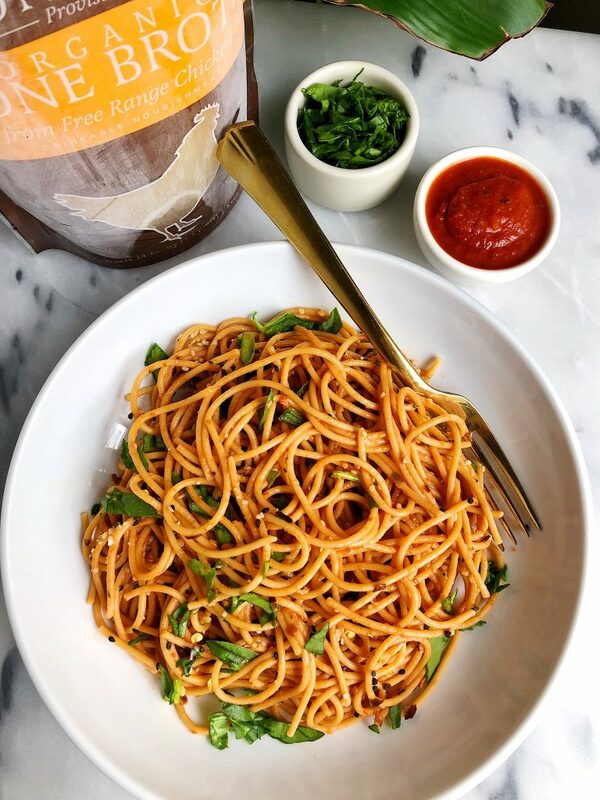 This Creamy Tomato Basil Pasta takes the cake lately. It is made with 6 ingredients and is gluten-free and dairy-free and so easy to make, I cannot believe I haven’t been cooking it my whole life (seriously). I use gluten-free spaghetti as the base and while that cooks, prepare the sauce. As Jord would say, I totally cheat because I used sauce already made, which is true but it’s the additions that make it completely epic. First I add some organic bone broth from Bonafide Provisions for extra flavor, collagen and nutrients. I drink my bone broth every single day and it is a staple beverage in my life. Whether its 95 degrees or 10 degrees outside, bone broth is life. I use Bonafide’s for all my at-home broth drinking and cooking. I love how easy it is to use in recipes and just sip on. You can find it in most grocery stores (in the freezer!) or order online (code RACHL). After adding bone broth, I also mix in some full-fat coconut milk for extra creaminess. 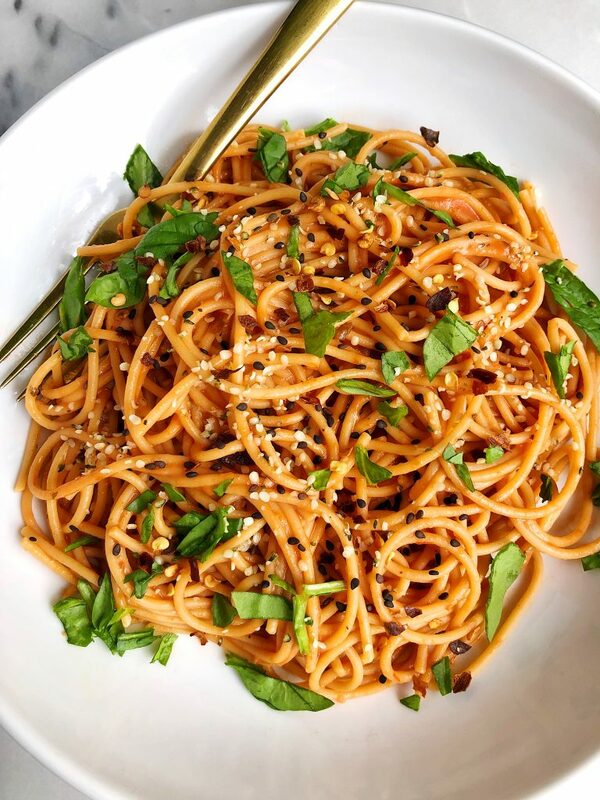 Think vodka sauce but so so much lighter. I add in some chopped basil, garlic and black pepper and it is ready! I also love adding some grass-fed meatballs for extra protein to this dish. Otherwise I’m hungry from pasta again in an hour. Once you stock up on Bonafide Provisions Organic Bone Broth, I have a bunch of recipes on the blog using it! A few of my favorites are: Sweet Potato Quinoa Enchiladas, Sweet Potato Bun Lamb Burgers and Paleo Crispy Chicken Nuggets. Cannot wait to hear what you guys think! You can also add some extra protein like grass-fed meatballs, chicken, anything! Thank you Bonafide Provisions for sponsoring this blog post. It means so much to me to partner with brands I love and believe in!